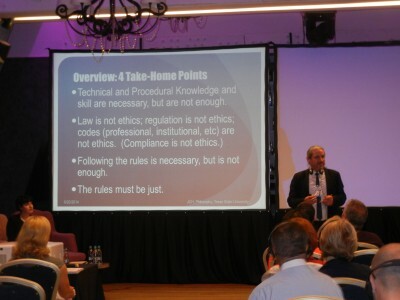 Texas State University’s Craig Hanks, chair of the philosophy department, delivers a presentation on ethics in the public sector. 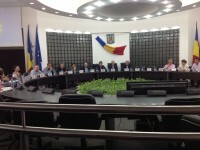 Members of SPMP meet at Romania City Hall and exchange with city council members and senior officials. 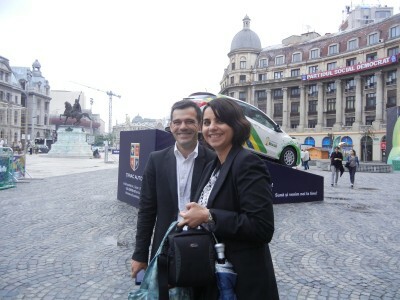 Romanian hosts, Ionut Iuria, editor-in-chief and Cristina Mita, managing editor lead a tour for SPMP members in Bucharest. ASPA’s Section for Public Management Practice (SPMP) is working with local administrators in Romania to improve local government practices. From June 16- 26, 2014, 30 ASPA members, including a number of SPMP members, attended and participated in the International Public Administration Forum in Romania. 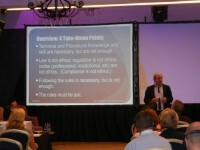 SPMP partnered with the Romanian Journal of Local Government Administration to host the forum held in Brasov, Romania. Over 100 local, regional and national public administrators attended the forum. Attendees included public administrators from Lithuania, Latvia, South Africa, Turkey and the Netherlands. The event was organized and sponsored by Ionut Iuria, editor-in-chief of the Journal of Local Government Administration and Cristina Mita, managing editor. SPMP members also visited the Ministry of Regional Development and Public Administration, where they attended a presentation by senior officials on Romanian public administration past, present and future. The ASPA group also visited the Palace of the Parliament and participated in a surprisingly candid and lengthy conversation with five national senators. These senators were responsible for shepherding a controversial regionalization and decentralization plan through the legislature. Visits and exchanges were also made with local government officials in the Romanian cities of Brasov, Bucharest, Piteşti, Sinaia and Tulcea. The Romanian trip and forum follows two U.S. visits by a group of Romanian local government administrators— the first in October 2013 to Orlando, followed by a March 2014 to Washington, DC during ASPA’s Annual Conference. During the first trip, the University of Central Florida hosted a meeting that provided an opportunity for dialogue between the administrators and SPMP. At the second meeting, SPMP conducted a one day forum attended by the Romanian administrators and staff of the Romanian Journal of Local Government Administration. 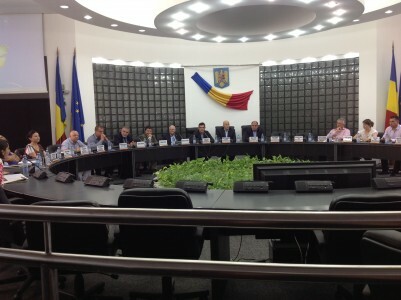 For additional information about the series of public administration exchanges between ASPA’s Section for Public Management Practice (SPMP) and the Romanian Journal of Local Government Administration please go to the Section’s website, http://aspaonline.org/global/blog/global-breezes-june-2014/. Authors: Howard Balanoff is professor and director of Texas State University’s William P. Hobby Center for Public Service. He is also the Director of the Texas Certified Public Manager CPM Program. He can be contacted at [email protected] or 512-245-3453. Warren Master is past chair of ASPA’s Section for Public Management Practice and Editor-In-Chief for the website, Good Governance Worldwide (www.aspaonline.org/global). He can be contacted at [email protected] or 571-331-2839.